2018 welcomes a brand new festival, POP PUNK PILE UP FESTIVAL that will take place at The Venue in Selby from the 27th - 29th April 2018. Riff Media has been running successful events all over the country for a decade and 2018 sees them branching out into the festival circuit. 2017 was a huge success for Riff Media who have seen a huge growth in their events and have gained a wealth of contacts which has helped them push forward with this new festival project. "Running events has been something we have done for 10 years and now we feel the time is right to show the world we can go that step further and host a huge event like a festival. We have opted to use the venue that we grew in. Music is a long held passion and this is a step forward for us. We are hoping to achieve success in our first year to help us develop and grow the festival!" - claims Adam Ruane, Pop Punk Pile Up Festival and Riff Media Director. 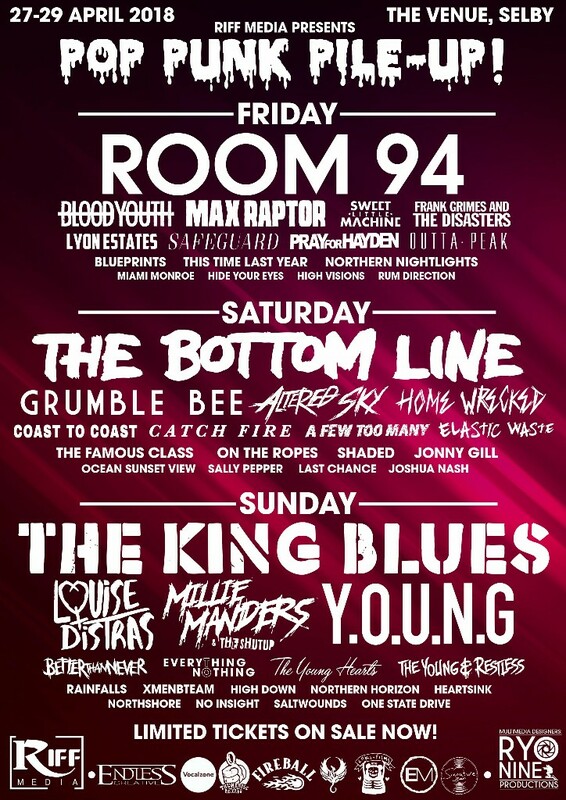 With the likes of The King Blues, Room 94, The Bottom Line and a secret headliner still to announce playing throughout the weekend, Riff Media proves that they have already grown interest from larger bands wishing to play for them on a larger scale. For their first year they have secured a fantastic line up for such a small, intimate setting, so trust us when we say, you won't want to miss it! 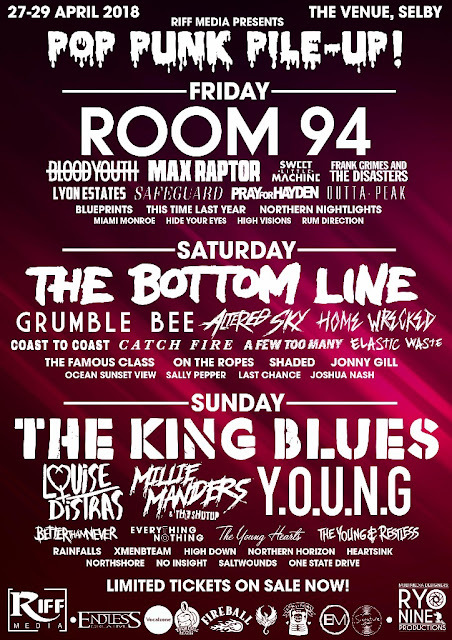 Riff Media are famous for their diverse line ups and POP PUNK PILE UP FESTIVAL will pride itself with a line up full of a mix of genres, so don’t let the name fool you! There are heavy bands, as well as alternative rock bands playing across the weekend and being held in such a small venue for a festival, Riff Media wanted to make the crowd feel welcome. It's definitely going to be one to remember and is guaranteed to be sweaty and loud!